Dublin & Galway, 7 June 2017: Acknowledging World Oceans Day (8 June), the Marine Institute has announced a line-up of global thought leaders to discuss a blue economy agenda that reflects the opportunities arising from our oceans, and the need to address a range of environmental, economic and societal issues. The 2017 Our Ocean Wealth Summit, which will take place on Friday, 30 June at National University of Ireland, Galway, will focus on the theme of ‘Rethinking Boundaries and Innovation for a Sustainable Marine Economy’. A key aspect of the summit is to announce progress updates on Ireland’s Integrated Marine Plan, Harnessing Our Ocean Wealth –an initiative of the inter-departmental Marine Coordination Group. A number of related marine industry and research events will alsobe held on Thursday 29 and Friday 30 June 2017, including the Digital Ocean Conference and the Marine Trade Show. Our Ocean Wealth Summit and related events are held as part of SeaFest 2017, Ireland’s national maritime festival, from 30 June to 2 July 2017 in Galway. Caption: Celebrating World Oceans Day, the Marine Institute has announced a line up of global thought leaders and expert speakers for the 2017 Our Ocean Wealth Summit at NUIG on 30 June 2017. 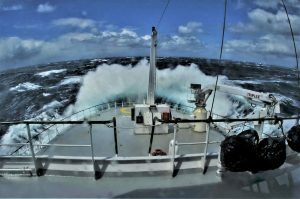 This image (all) were taken on a recent GO-SHIP Survey, which is and Irish-led international survey carrying out a ‘health check’ of the Atlantic Ocean on the national research vessel, RV Celtic Explorer, between St. John’s Newfoundland and Galway this April-May 17. Photo by Tomasz Szumski, Marine Institute.